Perma-tanned FitzPatrick, ‘Seanie’ to his friends -- which included the then Taoiseach Bertie Ahern -- was notorious as Ireland’s biggest ‘cowboy capitalist’. His bank’s chaotic gambles on the national and international property markets wrecking the entire banking system and pushing the state itself deep into insolvency. So there was widespread anger and disbelief among the public on Wednesday as he walked from court, wreathed in smiles, after beating all the charges against him. However, two of his fellow board members at the time, Pat Whelan and Willie McAteer, were convicted the following day. They were found guilty in connection with the narrow charge of providing loans to the bank’s biggest customers, for the purpose of using the funds to artificially prop up the value of the bank’s shares. The two men were found guilty by unanimous verdict of providing 450 million euro in illegal loans in the scheme to divert the bank’s funds for the purchase of its own shares. Six other charges were thrown out by the judge before jury deliberations began. 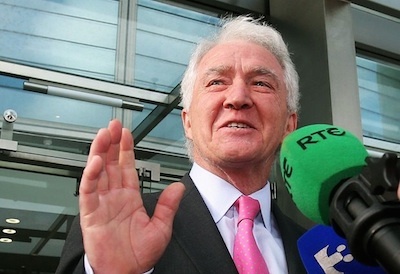 The court heard that a secret circle of trusted Anglo clients known as the Maple 10 were brought in to front up the Ponzi-like scheme, as share sales by former billionaire industrialist Sean Quinn, who owned almost 25% of the company’s stock, threatened to wipe out their value. David Drumm, described by the judge as the ‘author’ of the Maple 10 transaction and who is currently residing in the USA, has so far escaped prosecution. The jury was given no reason why the former bank boss wasn’t in the dock. And although he served as Chief Financial Officer of Anglo at the time the offences were committed, Matt Moran was granted full immunity from prosecution. Ireland’s infamously relaxed approach to white-collar crime has also been blamed for the failure to secure more convictions. By the time Anglo’s offices were raided in early 2009, it is alleged that most of the evidence had been destroyed. FitzPatrick was cleared on the basis that no documents were found linking him directly to the loans-for-shares scheme. Sinn Féin Finance Spokesperson Pearse Doherty TD said there was still a long way to go before the Irish people feel justice has been served on all those culpable in the banking crisis. “The failures in Irish banks, the reckless loans availed of by developers, combined with the policies of Fianna Fail, have caused great long term economic suffering for the Irish people,” he said. “Austerity budgets, unsustainable debt to GDP level, emigration, poverty, unemployment and repossessions have been the sentence handed out to ordinary people. The two convicted bankers were bailed and will to appear again before Dublin Circuit Criminal Court for a sentencing hearing on April 28. They face a maximum of five years in jail and a 3,000 euro fine on each of the 10 charges.